Hey there. I don't usually write about football during the offseason. It's just not the time or the place (in my opinion at least) but considering that the draft was a week or so ago and my team, the Raiders, made a few moves, I just had to let in on my thoughts. First off, the Raiders selecting LB Rolando McClain is the best draft move in years! After several disappointing or at least not yet productive draft picks, Al Davis finally went against picking a strong QB or a super fast WR in the first round and went with what the team needs, a tough LB to stand along side Seymour. Another thing that the Raiders did this offseason that raised a lot of eyebrows is their hoarding QBs. As of right now, the Raiders have 5 QBs on their roster. 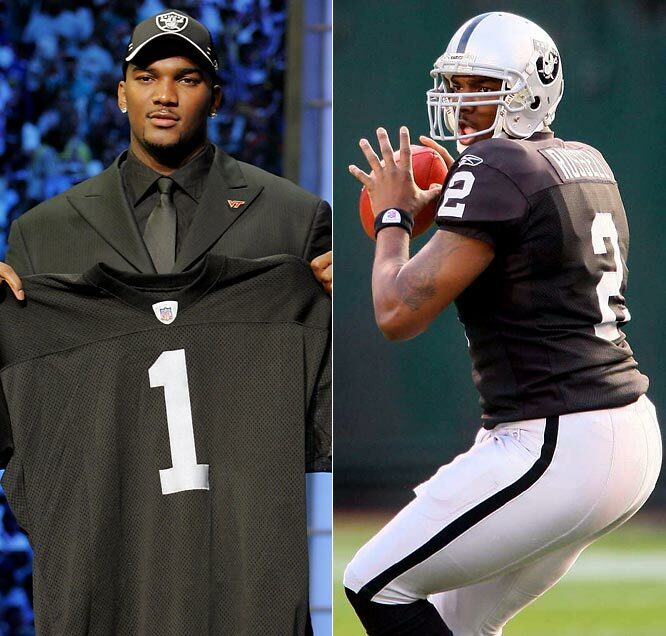 Former #1 draft pick, JaMarcus Russell has just not been what the Raiders hoped. Al Davis selected this young man based on his arm strength alone. Figuring that you only need someone to launch the ball down the field, the WRs would only need to run and go get it. The "Al Davis" method, as I call it, just doesn't work. We have all sorts of speedy receivers, but their hands are suspect. We have a QB with a cannon arm, but doesn't have the agility or the smarts to play in the NFL. He simply does not put in the work. And considering that this man is getting paid millions and is failing... it's really hurting our chances in obtaining good free agents. Now, I don't know if this is meant to scare Russell straight, but big news came in last week that the Raiders acquired QB Jason Campbell from the Redskins. Campbell is not steller, but he gets the job done. I strongly believe that he just wasn't a good fit for the Redskins. Maybe he'll shine brighter now that's in the Silver and Black. But why make a move for a QB knowing that you have Russell? Not to mention his back up QBs Gradkowski and Frye. And let's not forget the other QB that the Raiders acquired this offseason, QB Kyle Boller. Why are we stocking up on QBs? Conventional wisdom says that the Raiders are not happy with Russell and he's being replaced by Campbell. The remaining 3 QBs will be playing for the 2 backup spots. But now, I'm reading that owner Al Davis is not just ready to give up on Russell. What the hell?!?!?!? I love my team. I'll stick with them through the Super Bowl years and through their top 10 draft selection years, but man... what the hell are you guys thinking? We need to either cut our losses with Russell and focus on getting our team in place or get help in the Offensive Line to continue to develop Russell. If we cut Russell, I really don't see him playing in the NFL after only 3 short years. He's displayed some talent, but his inability to focus, to prepare, and quite frankly care about his job is detrimental to the Raiders and will more than likely be a cancer for other NFL teams as well. What we need to do is start Campbell and have him get acquainted with the receivers. He's glad to be a Raider. He's glad that we went out and asked for his services. You don't think that he'll want to succeed considering that he was in a QB controversy in Washington with QB Tavaris Jackson and new Redskin Donovan McNabb and we, the Raiders, went out there and asked him to join our team? Play the man that wants to play. He'll be ready, he'll be focused, and I'm sure he'll be a hell of a lot more productive than Russell has been. I'm sorry Russell, but my faith in you is gone. You've had more than enough opportunities to be the one to lift the Raiders from this slump and you just have not put the effort or the heart in your position. You've showed up to camp out of shape and unprepared and it all started to go downhill since the day you held out of your first camp to get more money, which wasn't even day 1 for you. At this point, don't be surprised if you start being compared to Ryan Leaf. Yeah, Russell, that bad. best of luck to you. Later!